Elegant turquoise engagement ring with moissanite and matching turquoise wedding band in sterling silver handcrafted by Hileman Silver Jewelry. Both the moissanite engagement ring and the matching wedding band are inlaid with beautiful blue turquoise. The turquoise engagement ring is 6.2mm wide at the top and tapers slightly down to 4mm at the bottom. The engagement ring has 3 pieces of turquoise inlaid on each side of a center set Forever Brilliant Moissanite. The .68 carat round moissanite is set almost flush, giving the ring a sleek low profile. Moissanite is a laboratory created gemstone with more brilliance than a diamond and is almost as hard. It is an affordable and conflict free alternative to diamond without sacrificing beauty or durability. The moissanite comes with a limited lifetime warranty and certificate of authenticity from Charles and Colvard. The matching wedding ring is inlaid with 7 pieces of turquoise that perfectly match the turquoise in the engagement ring. The wedding band is 4.5mm wide at the top and tapers to 3.8mm at the bottom. These turquoise rings are available as a set or may be purchased separately. The moissanite and turquoise engagement ring would also make a great stand alone wedding ring if you are not interested in a two ring bridal set. Special orders usually take 4 to 6 weeks to complete so please schedule your order to allow us plenty of time to create your rings and ship them to you. 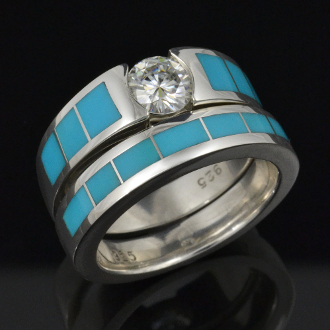 A matching man's 8mm turquoise band is shown in the 3rd photo. Price shown is for the set as shown with the moissanite engagement ring and ladies band.